behind the greatest Lie ever told ? Mecca Did Not Exist at the time of Muhammad ! Why is Mecca So Important? Islam makes it Mandatory for 1.5 Billion Muslims around the world to pray facing Mecca, 5 times every day. This Direction of Prayer is Called Qibla. This is not an optional prayer, it is Faraz, which means that it is compulsory. This is one of the five pillars of Islam. Every Muslim is obligated to visit Mecca to perform Haaj atleast once in their lifetime. This is another of the five pillars of Islam. But What if I told you that Mecca itself was a Lie fabricated by the Muslim Rulers who came after Muhammad ? What if I showed you evidence that Mecca did not exist at the time of Muhammad at all ? Either you would call me crazy, or, If you are a Muslim, you would slap me on my face, or turn away and run in the other direction. But hold on a second, just allow me to present to you the facts and I promise that it will be well worth your time. The Quran itself has verses that tell us that the Qibla was changed and a simple analysis shows us that the original Qibla was neither Mecca, nor Jerusalem ! I do not blame the Muslim for wanting to slap me or wanting to run in the other direction, because I would have done the same, until about a few years ago. How would you feel if you are about to find out that all your life you have been lied to ... your whole world view would be challenged and all your beliefs shattered. If Mecca is a Lie, then it implies that the two major pillars of Islam would fall ... How could it be ? I used to spend so much time of each day facing Mecca in prayer, if someone claimed that Mecca itself was a fabrication created after Muhammad passed away, then I could never accept it. But since I knew the Quran encourages the pursuit of truth, and since I was committed to science, I had to look at the evidence before making my conclusion, the overwhelming evidence opened my eyes. And the truth set me Free. I found the true Qibla and this lead to Freedom from Fear and Tremendous Peace. No I did not leave Islam, I found the true and pure Islam that could not be corrupted by Politicians or Kings. Now, I invite you to look at the evidence and decide for yourself. What is in the eBook ? The first part of the ebook shows evidence why Mecca cannot be the Original Qibla, the Second part of the ebook shows why Jerusalem cannot be the original Qibla. The Third part of the ebook shows why, when, how and by whom the Qibla was changed. The Last part of the ebook points in the direction of the true Qibla. All together, the ebook contains 85 Verses from the Quran, 21 Quotations from Hadith, 5 quotations from historians and 19 images, all of which prove that Mecca did not Exist at the time of Muhammad. Does the Quran Contain the Names of the false daughters of Allah ? How is the answer to this question related to Mecca ? How come Mecca Never had any Earthquakes ? How does the answer to this question go to prove that Muhammad was not born in Mecca ? What is the real meaning of the Elephant Sura in the Quran and what does this have anything to do with Mecca? No One has spoken about this before ! What do ancient records and maps say about the existence of Mecca ? We cannot turn a blind eye to this question even if it leads us in an unexpected direction. When all the evidence mounts up, they form huge Mountains and no amount of Faith can move these Mountains - what are these Mountains of evidence and what does it prove? Was Jerusalem important to Muslims at the time of Muhammad ? The answer is not what you think ! When was the Aqsa Mosque in Jerusalem built ? How does the answer to this question destroy everything we know about Jerusalem being the original Qibla ? Why was the Dome on the Rock Built in Jerusalem ? Historians are still not sure but after reading my explanation you will know the real answer. How many times in the Quran is the Most Important event of Hijra (Migration to Madina) mentioned ? Don't laugh, its an extremely serious question because the Muslim Calendar starts from this day. How is the answer to this question related to the Change in Qibla ? Has science found any fossil or DNA evidence of the flying horse that Muhammad used to fly to Jerusalem ? What does this evidence tell us about Mecca ? Where were the Qiblas of all the mosques built till 200 years after Muhammads death pointing towards ? Not it is not Mecca Nor Jerusalem ! You can check this yourself by uploading the KLM file provided into Google Earth ! The Quran Tells us the Qibla was changed, do you know the real reason why it was changed ? Read my ebook to find out - No other book, historian or scholar has revealed this till now ! How come the Quran changes the Qibla even before setting it for the first time ? A detailed analysis leads to an inescapable conclusion that will shock any Muslim who understand what is really being revealed by the Quran. Has the Kaaba in Mecca ever been attacked by anyone ? Who broke the black stone into pieces and Why ? Who Stole the Black Stone from Mecca ? Why Mecca cannot be the Qibla according to the Quran if the Black stone is Broken or Stolen ? This alone has huge implications for the Qibla even if everything else in the ebook is neglected. Where is the true Qibla? why this information has been hidden and by whom ? The true Qibla is a 5 letter word starting with H ! No it is not Mecca or Jerusalem, nor Petra even ! Read the ebook to find out what it is. The ebook uses a unique and innovative method of presentation. A dialog format is used to express the subject from different view points. Throughout the ebook, we have 6 characters [the believer, the scientist, the questioner, the historian, the author and the joker] discussing the topics as they develop. This approach not only makes the ebook easy to read and understand, it also makes it interesting and entertaining ! Thomas: I am not interested in Al-Lat, Al-Uzza or Mannat. All I want is the proof to know what is the truth. Ali: A true believer needs no proof to confirm his belief. Thomas: But I need proof before I believe. Ali: With faith even a stone idol can become a god but without faith even a god will become a stone. Thomas: That is the problem. The People who had faith in Al-Lat, Al-Uzza and Mannat made them into gods, if we apply the same blind faith to a god with a different name we are no different from those whom we call idolaters. Al-Khidr: Good Point. Superstitious Blind faith is the curse that humanity needs to overcome. The ebook contains Screen-shots from Google Earth showing how the Qiblas of ancient mosques point to Petra and not to Mecca. Google has mapped every square meter of earth and all this map information is available for viewing at any zoom level through Google Earth software provided free by Google. So you can check it yourself very easily, you dont have to believe anyone else. The ebook contains a link to a KLM file which you can open in Google Earth to see the exact location and orientation of all the Mosques shown in the Ebook. 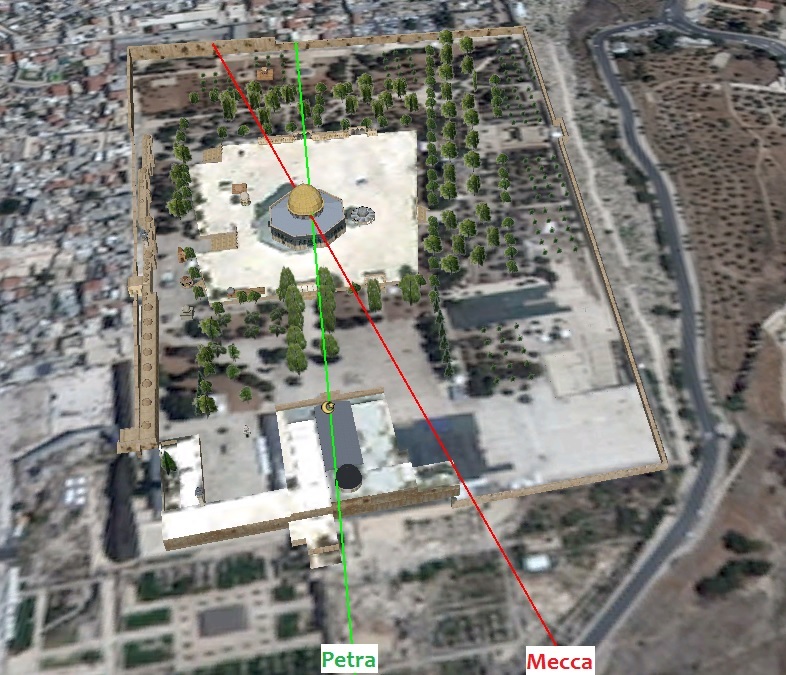 When you open the KLM file in Google Earth, you will see red, blue and green lines connecting the four ancient mosques including the Al Aqsa Mosque in Jerusalem to the Kaaba in Mecca, to Jerusalem and to Petra. The exact locations and the connecting lines are already in the file. You can verify yourself that the Mosques in the KLM file are all oriented to Petra and not to Mecca even today ! 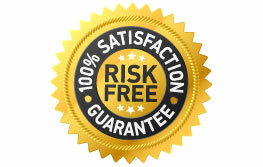 I am so confident about the information presented in my ebook that I am willing to stick my neck out and provide a 100% satisfaction guarantee by promising a full refund to anyone who asks. After you have read the ebook, if you are not satisfied that the evidence provided in the ebook shows that neither Mecca nor Jerusalem was the original Qibla, I will return 100% of your purchase price, no questions asked, all you have to do is send an email to [email protected] within 60 days of your purchase, asking for a refund and I will gladly return 100% of your purchase price. In addition, As a way of thanking you for giving it a try you can keep the ebook and you will not have to return anything. Wow, I did not expect to see such strong evidence from the Quran and Historians, showing how the caliphs Changed the Qibla after Muhammad, this should be read by anyone who wants to know the truth about where Islam actually originated from since its definitely not Mecca as you have so convincingly proven. I want to verify for myself if All Muslims are praying to the Wrong Qibla. That is why I am taking action now. and Receive Instant Access to pdf eBook! P.S. : After you have purchased the Qibla Conspiracy ebook, you may forward this life changing information to anyone you like, but please also forward the free ebook Freedom From Jihad along with it, because my aim is not to challenge the Muslim beliefs but to provide a greater view of Truth. P.P.S. : What you are about to receive is top secret classified information that has been kept hidden by the powerful rulers. You do not have to believe anything on faith, everything in my ebook can be easily verified by you. If for any reason you are not satisfied with the eBook, you can get a full refund by emailing [email protected] within 60 days of your purchase with your orderid, and your refund will be immediately processed, no questions asked. P.P.P.S : The Radical Jihadis will do everything in their power to shut down this website as soon as they discover it. If you do not act immediately you may never get this chance again. This is your opportunity to finally learn the truth about the greatest conspiracy in history, don't Miss It, Order Now.